Ch. Meisterhaus Goldie Hawnd SC, ROMX "Reese"
Reese is an amazing girl and we could not be more proud of her accomplishments. 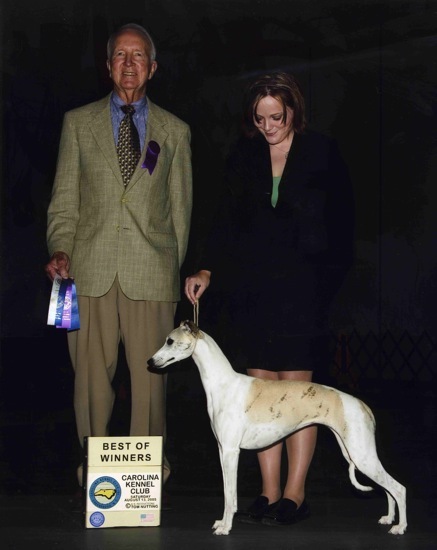 We are so proud of everything about her including her awards, in the ring, on the field and also as one of the top producing dams in the breed’s history. Joseph and I thank Gail, Chuck and Jenny Boyd for giving her such a fabulous home and making a breeder’s dreams come true. 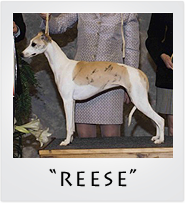 Reese’s accomplishments are like a book, that we will always be glowing with pride to read over and over and over again. Thank you, Gail, Jenny and Chuck. 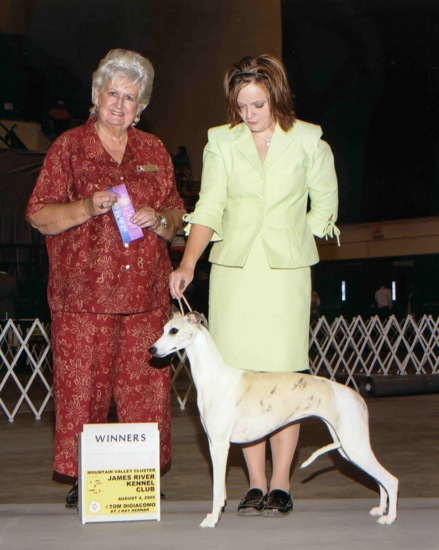 Reese completed her championship with ease at the wonderful hand of co-owner Jenny Boyd. 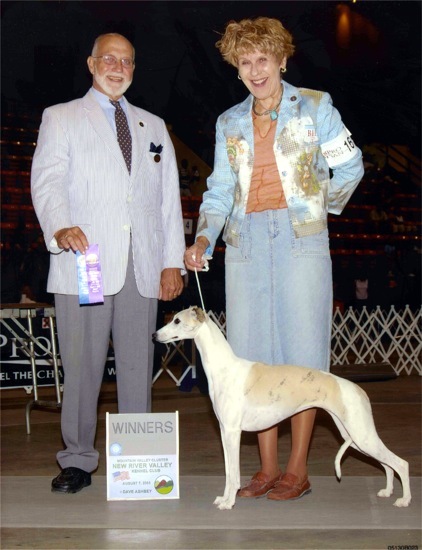 One of the great moments en route to Reese's championship was at the 2004 American Whippet Club National Specialty, where she was awarded Second Place in the Puppy 6-9 class (with an entry of 53), under respected judge Espen Engh. Ch. Ableaim Kiss Me Kate "Kate"
Ch. Ableaim Kodak Moment "Kody"
BIF DC Ableaim Kit Kat SC "Kitty"
Ch. Meisterhaus Ableaim Kick It "Beckham"
Ch. 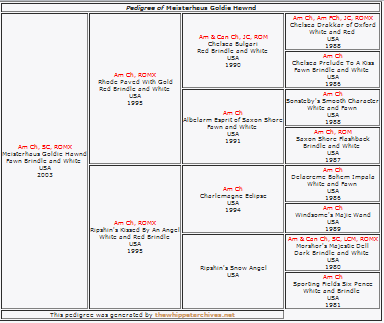 Ableaim Barchet Kurt Russell SC "Kurt"
DC Ableaim Keeper Of The Genes MC "Kenny"
DC Ableaim Keepsake Of Free Flite SC "Keely"
Ch. 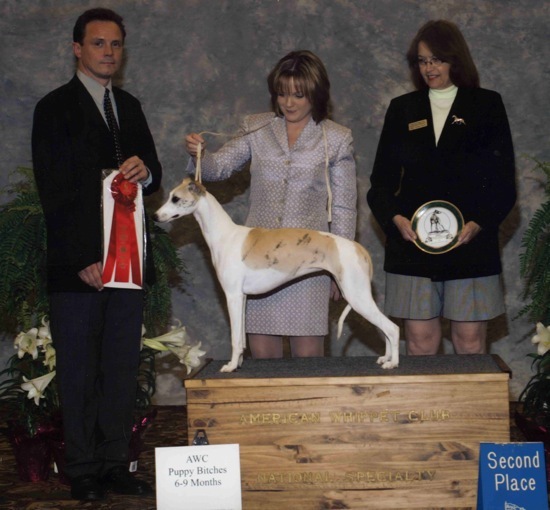 Ableaim Ketchin' Rays "Mojo"
GCh. Ableaim Masquerade SC "Minni"
Ch. Ableaim Meant To Be MC "Marlow"
DC Ableaim Morgan LeFay MC "Morgan"
DC Ableaim Making Memories MC "Makenzie"
From the "P" litter sired by Ch. Festiva's Knickerbocker ROMX - our up and comers! GCh. Ableaim Patent Pending "Patent"
FC Ableaim Play The Game SC "Pete"
DC Ableaim Picture Perfect SC "Posh"
Ableaim Penny For Your Thoughts "Portia"
Ch. Ableaim Panache Of Shojin "Flaire"